As development in Thailand is increasing, so is deforestation. 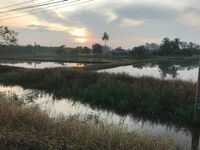 Acres of forests are cleared for contract farming, habitats are torn down to make room for new factories, and soil is eroded, causing massive flooding during the rainy season. But amid the environmental wreckage, some trees remain untouched. These trees are wrapped in iconic bright orange robes and deemed sacred, protected from harm and destruction. These trees have been ordained as monks. At a time when Pope Francis is calling upon religious leaders to step up as environmental advocates, Thai Buddhist monks are answering the call. Through rituals like tree ordinations, some monks in Thailand are integrating Buddhist principles into the environmental movement in order to garner support from their followers and encourage sustainable practices. Dr. Susan Darlington, professor of anthropology and Asian studies at Hampshire College in the US and author of the book The Ordination of a Tree, explains that protecting trees is a form of merit-making, an important practice in Buddhism. By accumulating merit through performing good deeds, Buddhists are ensuring a better next life and taking a step closer to reaching enlightenment and, ultimately, Nirvana. An ordained tree wrapped in the orange robes of a Buddhist monk found in a forest of Chiang Mai, Thailand. Photo by Kiley Price. One of the primary goals in the Buddhist religion is to end suffering, and the forests of Thailand are certainly suffering. With over 90% of the Thai population practicing Buddhism, monks hold an influential role as leaders to whom people look for guidance in all aspects of life. A young Thai girl follows three novice monks in the collection of the morning alms, in which they accept donations of food and drink to the temple from residents throughout the village of Chonburi. Photo by Kiley Price. 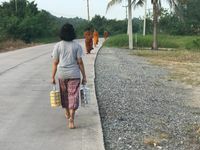 With such an immense amount of influence in villages throughout Thailand, monks are utilizing their position to add a unique moral dimension to the environmental movement. However, rituals alone are not enough. Although Buddhism is typically a religion famed for its detachment from society, ecology monks believe that their religion is inherently tied to nature. Buddhist monks like Phrakhu Ajan Somkit, who is based in Nan Province in northern Thailand where deforestation is an issue of major concern, are entering the political sphere to consult with government officials on environmental initiatives and rights for rural farmers. Other monks, like Phrakhu Win Mektripop, an ecology monk based in Bangkok, are trying to find more sustainable solutions to everyday problems by implementing solar panels in temples and helping villagers create cheap huts out of mud and natural materials. “When the Buddha was born, he was born under the tree. He was enlightened under the tree. His first sermon was under the tree. 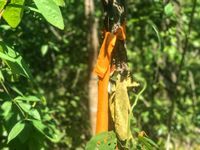 We can see that most of his life was related to the forest,” said Phra Win. With a master’s degree in environmental economics from Chulalongkorn University, Phra Win understands how important agriculture is to the rural population of Thailand. As Thailand shifted from a low-income to an upper-income society in less than a generation, however, sustainability hasn’t exactly been the focus of the country’s economic development. For instance, big companies like CP All Public, which owns over 10,000 7-Eleven stores in Thailand, are taking advantage of the rapid pace of growth by contracting rural farmers to mass-produce monocrops like maize and rice. A farm in Surin, Thailand, that only grows rice in its many fields. Photo by Kiley Price. Seeing no other options, these farmers continue unsustainable practices that are stripping the soil of valuable nutrients and plunging them deeper into debt. However, ecology monks are working to provide an alternative that is beneficial to both the environment and the people. Another of the most harmful environmental issues in Thailand is simply a lack of knowledge. Phrakhu Sangkom Thanapanyo Khunsuri, an ecology monk, at his farm in Surin, Thailand, where he follows the philosophy of sufficiency economy by planting many different types of crops. Photo by Kiley Price. In order to help teach rural farmers about the environment, Phrakhu Sangkom Thanapanyo Khunsuri, a prominent ecology monk based in Chiang Mai, developed an alternative farming school through his temple in Chonburi called the Maab-Euang Meditation Center for Sufficiency Economy. With 49 full-time students this year, Phra Sangkom mixes Buddhist concepts of personal reflection and a theory called “sufficiency economy.” This theory was developed by the previous Thai king, Bhumibol Adulyadej, and encourages subsistence farming, self-sufficiency, and a detachment from material goods. Along with teaching classes at his school and working in the field, Phra Sangkom often travels throughout Surin and Chiang Mai on speaking tours to bring his philosophy directly to the people. Each speech typically has over 100 attendees, he says. 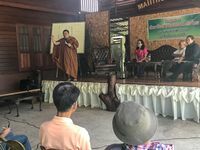 Phrakhu Sangkom Thanapanyo Khunsuri giving a speech on the importance of trees and stopping deforestation to the villagers of Surin, Thailand. Photo by Kiley Price. Ecology monks like Phra Sangkom have been marked as leading environmental advocates in Thailand, but some have also been marked with a target on their back. 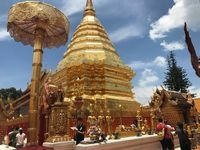 Wat Phra That Doi Suthep, a Buddhist temple found at the top of the Doi Suthep Mountain in Chiang Mai, Thailand. Photo by Kiley Price. As their environmental influence spreads throughout Thailand, monks are helping to obtain more community forest rights for indigenous people and farmers, which takes land away from both the government and logging and oil companies. Some monks have been prosecuted by the Thai government for their controversial activism. Others have been assassinated, like Phrakhu Supoj Suvacano, an ecology monk involved in trying to prevent the land around a meditation center in Chiang Mai from being converted into a tangerine farm. Even in the face of these threats, many ecology monks continue their work, which has started to receive help and support from other outlets, like local universities and NGOs. Kiley Price is a senior at Wake Forest University. Her reporting in Thailand was sponsored by the Pulitzer Center on Crisis Reporting in Washington, DC.